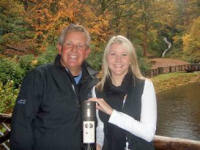 5th November, 2009 - Colin Montgomerie and Gavin Hastings visited Glengoyne Distillery this week as they set out on a charity walk along the West Highland Way. The sporting stars, who are walking the famous route along with 30 Malmaison and Hotel Du Vin employees, stopped off at Glengoyne, Scotland’s Most Beautiful Distillery, for a warming dram of Glengoyne Highland Single Malt Scotch whisky. Hotel groups Malmaison and Hotel Du Vin organised the walk to raise money for The Elizabeth Montgomerie Foundation which provides practical and emotional support to people affected by cancer. The team of staff from around the UK are aiming to help raise £100,000 by walking the 94 mile road in five days. The team at Glengoyne Distillery presented Colin Montgomerie with a personalised bottle of Glengoyne 10 Years Old, displaying The Elizabeth Montgomerie Foundation logo and a special commemorative message on the label. Colin personally signed the special bottle to be auctioned to help raise even more money for the Foundation. Glengoyne is one of Scotland’s most accessible distilleries, located just 30 minutes north of Glasgow and looking out over the breath-taking Trossachs.